There are many ways to insulate your attic space and protect your home’s attic space, with varying levels of effectiveness. We are a full service insulation company and can properly install all forms of attic insulation. We do though highly recommend Spray Foam insulation, due to it’s high level of performance, which also helps prevent weather and moisture related damages. There are two proper ways of insulating an attic, a vented attic space (traditional insulation, or can also be spray foam) and a non-vented spray foam attic space. Our Insulation experts can help guide as to which is the best fit for your specific home design. The non-vented attic assembly is usually considered the most effective application by members of the spray foam industry because it effectively seals off and insulates the entire attic space from any air infiltration. The air barrier is created by applying foam directly in between the rafters, on the roof deck, gable wall ends, and down onto the top plate, completing the connection to the wall insulation. The somewhat new practice of insulating the underside of the roof in the attic has raised much debate in the building industry because “standard” roofing and design techniques call for the attic to be ventilated in order to reduce moisture problems and heat build-up in the hot summer months. This way of thinking couldn’t be further from the truth. At the peak of the summer months, it’s not unheard of for a traditional vented attic space to reach 140 degrees, or hotter, in the summer. There’s no reason for your air conditioning equipment and duct work to be exposed to those types of severe conditions and they have to work much harder when they are. This will shorten the life span of your HVAC equipment, not to mention cost more to condition your home. There is also opportunity for moisture to form, due to condensation, on these appliances and the actual roof deck itself. A Spray Foam non-vented attic assembly eliminates the possibility of condensation. To effectively insulate the attic space from the extreme heat that radiates through the roof, the sheathing, and the singles, spray foam needs to be applied directly to the underside of the roof deck. This provides the attic with the type of insulation that blocks out these extreme temperatures. The attic then becomes as comfortable as any other room in the house, since it is now a “conditioned” space. Spray foam reduces energy consumption in several ways when it is applied on a roof. It can essentially eliminate energy loss from ducts located in the attic, since any duct leakage is leaking into conditioned space, as opposed to, outside the insulation envelope. With less infiltration and exfiltration, humid moisture laden air isn’t pulled into the attic through any “venting” process. 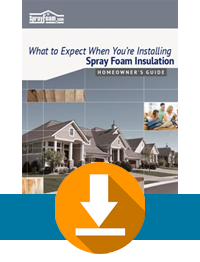 Spray foam also eliminates air infiltration/exfiltration through the ceiling, by moving the insulation envelope to the roof deck where there aren’t any penetrations for plumbing, lights, and wires. It reduces energy consumption because it stops the stack effect.